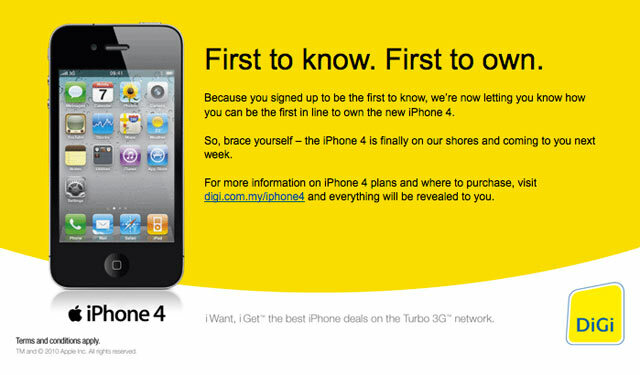 The two major carriers in Malaysia, Maxis and Digi, have more or less revealed that the iPhone 4 will be launched in Malaysia next week, September 23 or September 24. The long wait is over, however many early adopters and enthusiasts/ hipsters have obtained their iPhone 4 and iPads from the grey market. The nearest country where official iPhone 4 and iPads are available is Singapore, approximately 4 hours drive to the south of Malaysia's residential and commercial capital, Kuala Lumpur. Prices and plans have not been released, however it is predicted that outright purchases will fall between RM 2,000 to RM 3,000, very roughly about between USD $667 to $1,000. Just as in many countries, the handset will be subsidised depending on your monthly commitment. iPhone 3GS models are currently available free on 24 month contracts, with monthly payments of up to USD $100. http://www.smashpop.net/iphone-4-in-malaysia (not associated with nvidia2008) has a good summary of the drip feed of information that led to the final release of this news. 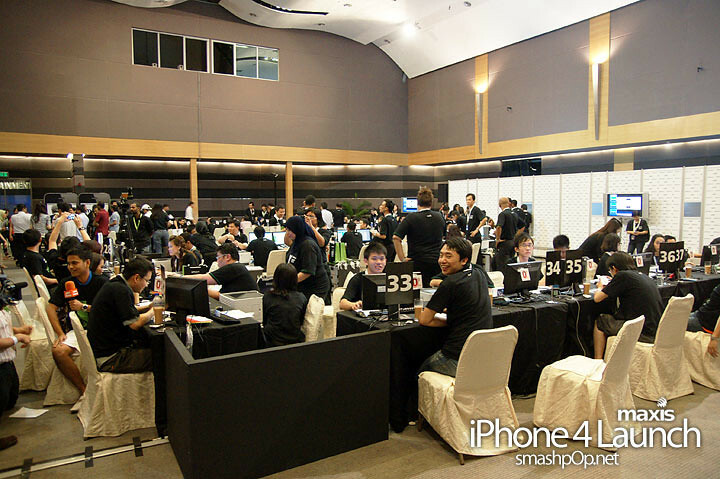 As with most iPhone launches in Malaysia and around the world, very little information is available on the pre-order and launch-day fulfilment of the iPhone 4. More details are expected in the next few days. Demand is almost certainly going to be intense, with the first batch of iPhones likely to sell out within days, despite widespread availability of the latest Android smartphones from companies such as Samsung and HTC. While the media continues to play up the rise of Android in the US, here, just like anywhere else, it is just a matter of Apple producing enough iPhone 4 and iPad units to keep up with global demand. Of particular concern to many global consumers is the upcoming US holiday season quarter which could constrain global availability of Apple's non-Mac products. iPhone 4 will be the tip of the arrow of Apple's flagship iOS products here in Malaysia - the iPad and the latest iPod touch are not yet officially available. All iPhones sold in Malaysia are fully factory unlocked, although iPhones purchased in Malaysia, similar to other countries, are only covered by a local warranty. This is unlike Apple's other products such as Mac, iPod and iPad which have international warranties (iPad can only be serviced in countries where they have been officially launched). Further information has come in. According to Maxis, the iPhone 4 will be available for purchase at selected Maxis Centres within Klang Valley (KLCC, Pavillion, The Gardens, TTDI, Sunway Pyramid) starting Sunday, 26th September and is expected to be available nationwide starting 27th September. These prices are subsidised depending on the contract and rate plan, although at this stage it does not appear that Maxis will sell contract-free phones. Information from the other major telco, Digi, has not yet arrived. So wish it could come to Honduras. That way I can use it without having the carrier break my arm and legs with payment plans. More information has arrived. I will be focusing only on one of the carriers where I hope to purchase the iPhone. The telco's name is Digi. Launch date is confirmed for the 24th of September 2010. One of the major retail stores where it should be available on Friday, September 24th. For one of the major venues, they are having it at a BMW showroom. Yes, it's really weird. Basically if you sign up for a 2 year contract, regardless of your monthly committment (between USD $20 to USD $50) the iPhone is approx USD $670 for the 16GB iPhone 4. Only 2 year contracts are available, there are no outright purchases or one-year contracts. There is a "ezy payment" (hire purchase) scheme with 0% interest on selected credit cards. Welcome to Malaysia. If I told you a Ford Fiesta was the equivalent of roughly USD $30,000, would you believe me? Certain things are quite expensive especially compared to low wages here. There are several other problems. I've been away for a long time, so it's been tough getting used to how some things haven't changed, and the fact it is still a "developing" country after 50 years of independence from the British. Today though, all I care about is getting my damn iPhone 4 finally. Hope it works out, I'm in front of the store right now waiting for it to open, typing this on my iPad. 1.5 hours till the store opens. Just me and I think another couple. Got my iPhone 4, it was relatively quick, just waiting for my line to be transferred from the old SIM to the new microSIM. It is a strange country. I am surprised that a nation which has such an openly racist constitution does not face more international criticism. It's the 21st century, and I am convinced that Malaysia's development is being held back by failing to offer simple equal rights. It is quite stunning, and shocking. The only reason why it does not garner open international condemnation is because freedom of religion is reasonably practiced... But there's a whole web of educational, institutional, commercial and political biases. Many locals think, oh, if I am non-Caucasian in western countries then it would be worse. That's not often the case anymore in western countries. Yes I would believe you, because in Honduras, it's about the same thing. I just discovered the IRB does not really respect the idea of a limited liability company. What a great way of encouraging business to move to Singapore. Just one of the few reasons Singapore has an edge over Malaysia, in some aspects. So far the Digi and Maxis launches have no Free Case program. However there is a workaround. We are pleased to inform you that one or more of your items has shipped. Please see the details of the shipment below. If you ordered more than one item, they may ship separately.